"Failure is just delayed success." Un Gran Dia Para CicLAvia! On Sunday, October 7, we took our campaign public in front of over 100,000 Angelenos for the fifth CicLAvia, which temporarily closed 9 miles of streets for the car-free enjoyment of all. Now in its second year, the twice-annual event offered the same thing as its previous four iterations: Perfect sunny skies, people enjoying Los Angeles in a different way, and thousands of smiling faces. We started the day with a feeder ride at the old CicLAvia starting point – at Hel-Mel (Heliotrope and Melrose), in front of the Orange 20 Bikes shop. We zip-tied campaign signs to our bikes and led a feeder ride of nearly 20 cyclists from Hel-Mel through the streets of the 13th District to the new start of the route at Mac Arthur Park. 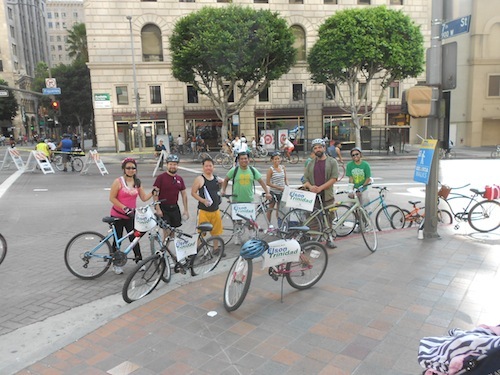 Some of the bike riders at Hel-Mel looked lost, wondering what happened to CicLAvia. The organizers told me that the City wanted the route to retain the same 9-to-10-mile length, so adding any new routes meant cutting some of the old ones. I also met a few riders who lived in the 13th District as well, so it was a great opportunity to meet new folks. Even with cars on the street, it didn’t take us long to get to Mac Arthur Park (though there was one insensitive driver on New Hampshire that we didn’t care much for…). We also caught up with more friends and supporters along the way; from Downtown we rode south on Figueroa to Exposition Park, where a mini-festival underneath the California ScienCenter’s United DC-8 jet plane was going on. Adjoining it was the California African American Museum’s first-Sunday-of-the-month marketplace event. Social Action Partners’ Building Healthy Communities South LA project promoted community health with a photo booth encouraging participants to pose with a whiteboard reading “Health Happens With…” and left the rest to be filled by the participants. I got my picture at the booth, posing with my bike and answering with “Bicycles!” – After all, I ride my bike not just for transportation, but for health as well. From there we went back north and through 7th, Spring and 1st streets in Downtown to the 4th Street bridge, where we used the view to take pics. Time was already running short, so we headed back to the Civic Center and on to Chinatown where we took part in the post-CicLAvia party at the Chinatown Central Plaza. Riding bikes through car-less streets is a great treat, but even better is hanging out and meeting faces, both old and new. That’s the real value of CicLAvia — a chance for people to connect and interact that was unimaginable in this city even 10 years ago. I first heard about CicLAvia three and a half years ago at an event I attended called the L.A. Bike Summit. 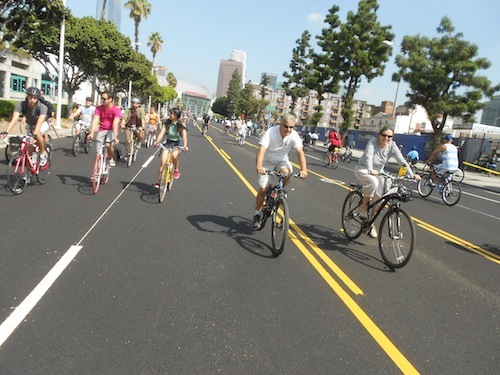 The organizers proposed starting an L.A. version of Bogota, Colombia’s “Ciclovia.” Closing the streets to an event that wasn’t a race or a festival was daring, yet exciting, and I helped them get connected to our neighborhood council. That was one of the reasons why CicLAvia started in East Hollywood. We need more events like this in Los Angeles, whether it concerns bicycles, pedestrians or just people having a chance to collectively enjoy something together and renew their love and appreciation for their city. As a city councilmember, I would most definitely advocate for more frequent CicLAvias – be they quarterly, monthly or weekly – and support similar people-oriented events. 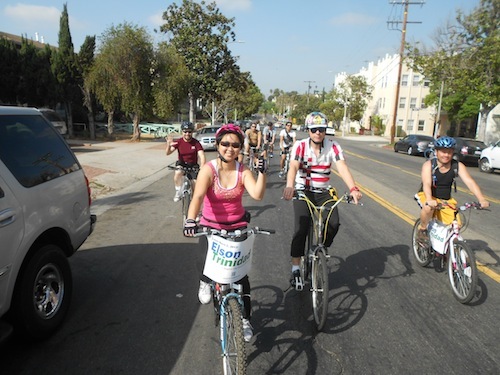 Check out more pictures of our CicLAvia ride on our Facebook page! Elson Endorses Robert Negrete For Council District 13! Celebrating 41 Years In CD13! ©2012 Elson Trinidad For City Council 2013. Paid for by Elson Trinidad For City Council 2013 FPPC #1351078.